Primary Natural Resources bauxite, copper, calcium carbonate, gold. 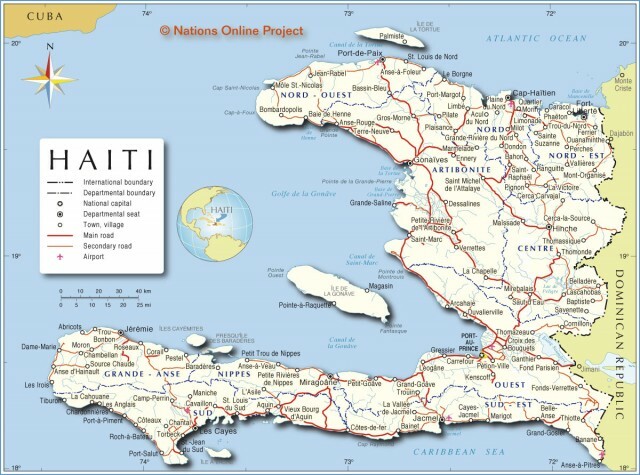 HAITI IS LOCATED on the western third of the island of Hispaniola in the CARIBBEAN SEA. The country is mainly mountainous, with 60 percent of the land on gradients of at least 20 percent. The mountain ranges of Massif de la Hotte, the Massif de la Selle, and the Chaine du Bonet encompass much of the land. Two large peninsulas are present in the country. The peninsulas are separated by the Golfe de la Gonave. The fertile river valleys and deep forests, which once provided beautiful sights, have diminished to a few. Haiti has suffered from deforestation, which has left only three percent of the land untouched. Much of the nutrient-rich topsoil has been washed away into the surrounding waters, which has destroyed home of the marine life. Because of the distinct range of elevations, the country has numerous plant species: 5,000 are spread throughout the land, including 600 fern and 300 orchid species. These plants thrive in the hot and humid climate throughout the year, with temperatures ranging from 65 degrees F (20 degree C ) to 85 degrees F (30 degrees C). The history of Haiti is full of turbulence. After almost 200 years of rule, SPAIN ceded the western portion of Hispaniola to FRANCE in 1697. This area named Saint Dominique soon became one of the wealthiest nations in the Caribbean. Sugar plantations arose throughout the nation, and slaves were brought over in large numbers. In 1791, a slave revolt, led by Toussaint Louverture, broke out across the colony. Louverture named himself lieutenant governor of the state in 1796. However, in October 1801, after a victorious campaign in Europe, Napoleon ordered an expeditionary force to Haiti to reclaim its lost colony. By November 1803, the last of Napoleon’s forces were routed and on January 1, 1804, the war-ravaged colony was soon declared independent of French rule and renamed Haiti. In 1844, Santo Domingo (soon renamed the Dominican Republic) declared its independence from the struggling country. Haiti seemed to be spiraling into obscurity in the world stage. From 1843 to 1915, 22 dictators ruled the country. In 1915, the UNITED STATES invaded Haiti hoping to create stability in the country. By 1937, the American troops left the country, with the belief that the country was a modernized and thriving. For the next century, the Haitian government continued to struggle. During World War II, increased world market prices increased Haitian trade and greater exports. However, after the fighting ended, the country was still mired in poverty. François Duvalier was elected president of the country in 1957. Throughout his power, Duvalier struggled with the Catholic Church and citizens fleeing the country. He died in 1971, but his son, Jean-Claude Duvalier, took over the position. The Haitian economy continued to suffer and its external public debt increased to a staggering $366 million in 1980. The Haitian people continued to flee. During January 1986, urban resistance overspread the country, led in particular by Jean-Bertrand Aristide. On February 7, 1986, Duvalier left Haiti, and General Henri Namphy, with American support, took control of the country. The Haitian government continued to promise the United States that elections would occur in November 1987. Three years later, Aristide won the presidential election. He took office in early 1991 but was overthrown by a violent coup. During this three-year period, a military de facto regime ruled the country and refused to return to a constitutional government. The United Nations ultimately passed a resolution and sent in a multinational force to restore order in the country. Before the American-led force actually stepped into the country, a deal was brokered, which the Haitian de facto government peacefully accepted. Aristide was returned to the country, where he became president and the constitutional government was restored under the watchful eye of the United Nations. For the next 10 years, the international optimism surrounding Aristide slowly diminished. He became embroiled in a variety of corruptive practices and many questioned the fairness of the presidential elections. Opposition parties rose and by early 2003, violence from all political sides began to flare up once again. In February 2004, Aristide fled Haiti, and afterward, U.S. Marines arrived along with 3,600 other international peacekeepers, to stabilize the situation. Haiti once again is trying to reestablish itself from its troubled past.